Oh Little Alcove…What Shall You Be? This space is in our new apartment. As soon as I saw it, I thought it would be perfect for a sewing/ craft space! My sewing machine could be out, I could put some shelves up and organise everything nicely. However, I then realised that the space is directly opposite the kitchen and is included in the hallway space. I don’t mind being in the way of walking down the hallway as it’s only Adam who would be walking past but I’m worried about kitchen smells. Do I really want to be sewing a lovely dress and then cooking chicken fajitas mid make? No… I don’t want my WIP’s to smell of food! So the sewing station has been abandoned for now and I think I like the idea of having a desk there but possibly incorporate some kitchen items into the area too. I’ve picked a few examples from Pinterest that have aspects that I like. In the space below, I really like the art on the side walls, the plants & the photo collage on the wall. Our polaroid pictures would look great like this! 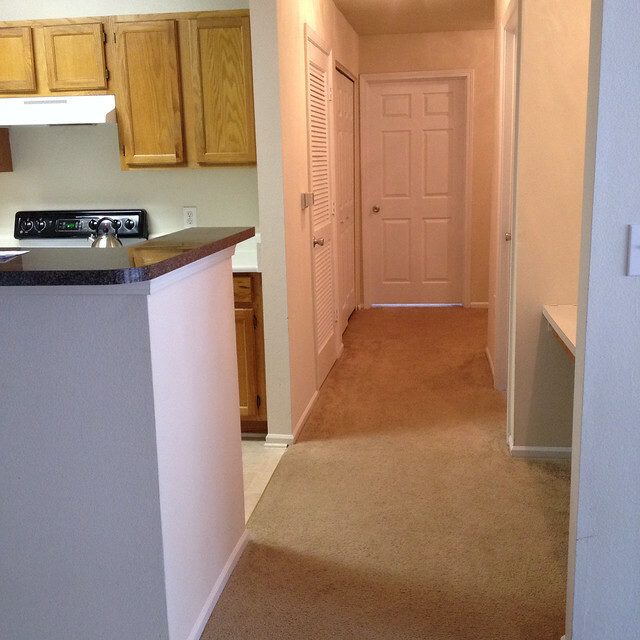 Even though I want this to be a working space, I don’t want it to be where we dump our stuff! 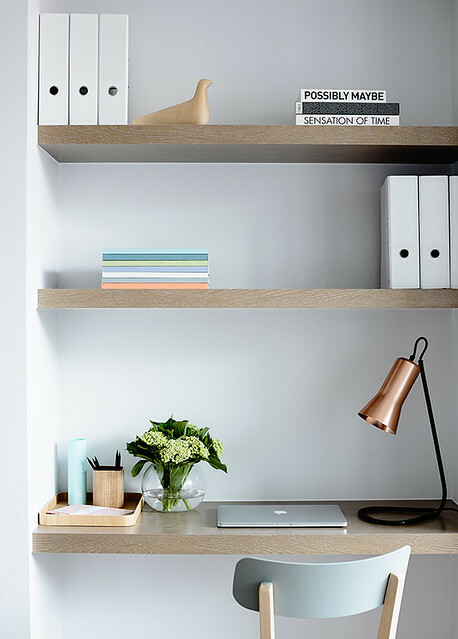 The simplicity of this desk is lovely but I think it would be quite hard to keep our area this tidy! 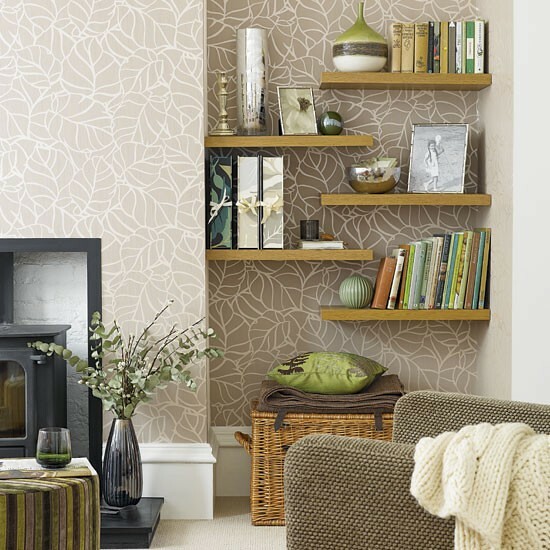 Floating shelves are appealing to me the most at the moment and I think because our space is quite wide, these staggered shelves would look quite nice. 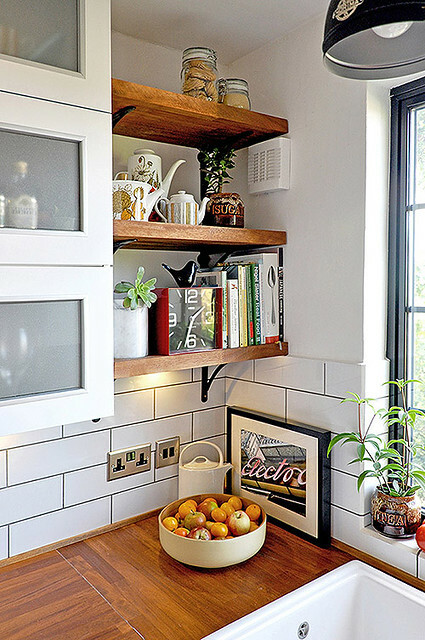 Though the following picture shows kitchen shelving, I really like how kitchen objects have been used as ornaments alongside books & plants. I have a couple of nice vintage jugs & floral cake tins that I would like to display, rather than stuff them in a cupboard. It would be great to know what you think of the ideas I have for our little alcove! Do you have a space like this? Have you got any more ideas for me? You’re probably right about the kitchen smells so best not use it for sewing. 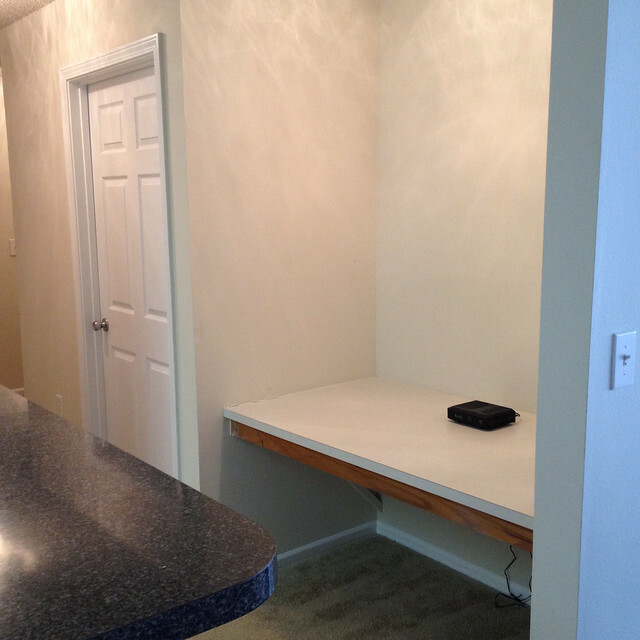 Before our office was built we used a similar sized alcove as a computer station. It was hard to keep it tidy though, so ended up putting a door on it! Yes, I have a few pretty kitchen items that could easily be displayed 🙂 I just need to decide what colour my shelving will be! Pingback: Talented Tuesday Link Party #25 - Cook. Craft. Love.